For many artists, it is a lack of exposure rather than a lack of talent that keeps the public from seeing their work. To rectify the situation, MOV!, an organization dedicated to promoting art, is using Facebook to try and get some aspiring artists the exposure that could make their career. Here's how the on-line competition works: for the next few weeks, the Art Walk America contest will accept submission of artworks through its Facebook page, ArtsWalkAmerica. The works will be displayed on the Faceboook page, a live voting will take place, and the most popular piece will be announced on July 4. 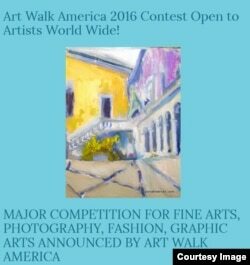 A Facebook image of the Art Walk America Contest, June 18, 2016.